What: A four-part course of the core principles of observational drawing. 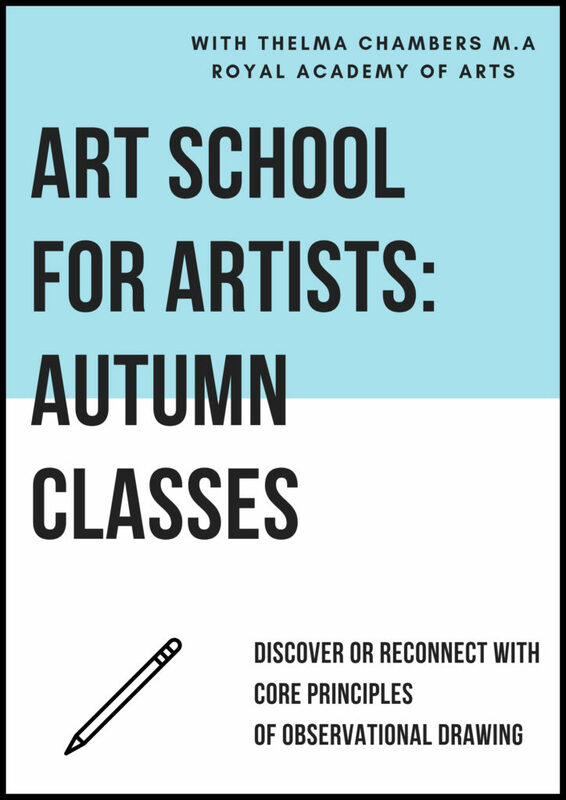 Who: These classes are designed and delivered by fine artist Thelma Chambers, a graduate of The Ruskin School, Oxford University and The Royal Academy of Arts. To learn more about Thelma, or to view her previous work and experience, go to -thelmachambers.blogspot.com. Where: Greyfriars Art Space, 43 St James St, Kings Lynn, PE30 5BZ. When: Fridays and Sundays from 10:30 AM – 2 PM beginning on Oct. 5th and running until Oct. 28th. Each class is three hours long and will feature a mixture of practical work and verbal presentation. Cost: £35 per class OR £120 when you sign up for all four classes. Payment is accepted by cash or by cheque made out to Thelma Chambers and should be brought to the first class you attend. The A.S.F.A is unable to offer refunds for classes not attended. Deadline: Sign up by Sunday, Sept. 30th. What to bring: Putty or soft rubber, pencil sharpener, pencils (1xB, 1x3B), fine-point permanent marker, cartridge paper pad (minimum size A4), drawing support board, clips or masking tape, small standing easel. Materials Needed: putty or soft rubber, pencil sharpener, pencils (1xB, 1x3B), fine-point permanent marker, cartridge paper pad (minimum size A4), drawing support board, clips or masking tape, small standing easel. Additional Materials Needed: No additional materials are needed for this class. Additional Materials Needed: willow charcoal (not compressed), sugar paper (minimum size A3). Additional Materials Needed: willow charcoal (not compressed), soft cloth, sugar paper (minimum size A3), paint media of your choice including white and black and all appropriate kit, palette, palette knife, some small boards (minimum 6 x 4 inches) for studies.